City of Edinburgh Council has designated 30 Local Geodiversity Sites as Local Nature Conservation Sites, identifying each site in the Proposals Map associated with the 2016 Local Development Plan. A specific Environment Policy (Policy Env 15 Sites of Local Importance) within the Local Development Plan sets out the protection given to landscape and geological features of local importance. 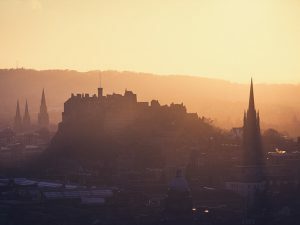 The 30 sites are described in a separate section of this website, with site descriptions and photographs prepared by Oliver Buchanan in a project with the City of Edinburgh Council. This was the ‘Geoscience Outreach and Engagement’ module of Oliver’s final year BSc Geology course at the School of Geosciences at University of Edinburgh. Edinburgh’s Local Geodiversity Sites leaflet. West Lothian Council adopted the West Lothian Local Development Plan in September 2018. This includes an Environment Policy with a presumption against development aﬀecting areas of regional or local natural heritage importance such as Local Biodiversity and Local Geodiversity Sites, or their settings. Supplementary Guidance on Green Networks is to be published including site boundaries and citations covering specific geological merit, socio-economic value and recommendations for retention and interpretation. East Lothian Council’s Local Development Plan (September 2018) fully integrates geodiversity and biodiversity within its Natural Heritage policies. As described in Technical Note 11: Planning for Geodiversity and appendices, sites designated in the 2015 Geodiversity Audit as Local Nature Conservation Sites are shown on the Proposals Map, with Geological Conservation Review sites (of national importance) given the same status as Sites of Special Scientific Interest.